First off, Sheep Patrol the game's title just makes me laugh. It was just so strange. It reminds me of that really popular game called Goat Simulator 2014, for some reason. It just sounded so ridiculous, and that's exactly the reason why I was pretty excited to play. I didn't know what was gonna come at me. What kind of game would this be? Is Gamekid serious? I didn't really know. Seeing that this game has 9 levels, I guess this game is serious.. Then again, it could be just a long game made for laughs, but it isn't. Because if it was, I wouldn't be reviewing this game. Or this review would be some sort of joke as well. I probably won't be doing any 'joke' reviews though, since I don't really have any plans for my reviewer badge to be taken away from me. So, I finally begin to play Sheep Patrol. And well, it's basically about a farmer and a sheep going on this crazy adventure. Sheepy, the sheep would always follow the farmer. That was the main concept of the game. It makes me wonder if this was based on the song 'Mary had a little lamb.' They somehow manage to go to well... everywhere. They even somehow manage to stumble upon a mini boss and a boss. Who knew the world could be so dangerous? If there's something I strongly disliked in this game, it would be the controls to be completely honest. It was difficult to handle and move your character. It was also very difficult to get used to the controls. It was pretty frustrating, but not in a good way in my opinion. Especially because the character would move on his own even if you didn't touch a single button. The annoying controls felt like a burden to the gameplay. The gameplay could have been a lot better if the controls were improved. The main concept of the game on the other hand, was really creative in my opinion. That was the main reason why the gameplay felt so unique. But nooo, the controls had to be bad. The controls just ruined it all. The controls could also be the reason why I didn't find Sheep Patrol to be too addictive as well. It felt like a chore to play through all nine levels. Well, eight if you didn't count the intro level. The game is just a bit too long for anyone to really be able to endure playing through without getting bored or frustrated. (I'm pretty sure you can all tell why I felt so frustrated while playing through the game. If you can't, let me call on Capt. Obvious. The controls were annoying, it made me not want to play the game at all.) If you don't get to the boss levels, you'd just find this game to be quite boring. It can get a little bit fun at times, but that would really depend on you. But, you'd see the funner side of Sheep Patrol once you do reach the boss levels. Though, you'd have to be really patient to get to those levels. As for the placements of Sheep Patrol, it was pretty messy in my opinion. Though the placements of blocks wherein you can 'ditch' Sheepy were very smart, it was still messy overall. I do appreciate the enemy placements though. 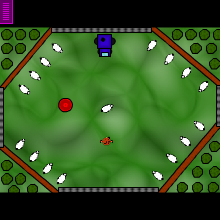 The enemies were very hard to avoid throughout the game. I also do like how you should really think before you act before playing each level. If you don't, you and Sheepy would probably just die there. That happened to me a lot of times, my brain just hates functioning whenever it needs to. What I really disliked was the block placements. Some of them were placed in good areas, but most of the time, it was just a mess. The blocks that were supposed to be 'decorations' didn't really look good at all. It was just like my study room whenever I have a project due the next day. It was an absolute mess. My inner OCD just wanted to fix everything. But, there were times when it actually looked pretty decent. I think Gamekid at some point just felt lazy to make some levels. He probably put all his effort on the boss battles and forgot about the rest of the levels. What I'm going to say here is probably really similar to the paragraph above. The design of the game was pretty messy as well. Gamekid could have chosen better colors and textures to match each area. The whole game looked like unicorn poop. (Also known as rainbows.) It was really colorful, well a bit too colorful for my taste. The patterns are a little bit too extravagant for me as well. I'd prefer it if it were a bit more simplified, too much of something can be bad too. Some people may like it, but I don't really find the design of Sheep Patrol to be aesthetically pleasing to the eye. Gamekid could have greatly improved the overall design of his game. Anyway, I did enjoy the randomness of Sheep Patrol. The places were absolutely random. Gamekid must've been really, really bored. But, I would like it a lot more if the levels were somehow connected to each other. Like, how the hell did Sheepy get there? Wtf is this farmer doing with his life? (When Gamekid said adventure, he meant it. xD) And uhm, since when did Sheepy become a superhero and fight a boss? xDD Sure the storyline did say Sheepy was talented, but if you're being realistic about things... That isn't possible lmao. I think Sheep Patrol is a really creative yet weird game. The concept is actually pretty new to me, I haven't seen it on the previous games I've played. That is actually quite rare since I've played a lot of games here on sploder. The randomness of the game for me, is a plus. The only reason why this category didn't get a perfect score is because the design was pretty messy. The block placements were really messy, but the enemy placements were pretty good. I think this game's very original. That octopus boss level was something I have never seen, plus the main concept of the game was really new to me as well. It was pretty so-so on the addictiveness, it's pretty fun, but it can get boring at times. The difficulty was pretty okay for me, but it may be a little too difficult for the average player to be able to complete easily. Especially with the annoying controls.